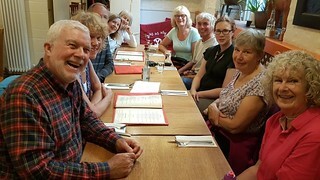 Angela D, Wendy, Prudence, Graham, Tessa, Sikka, David and Terri met at Bath Youth Hostel and walked the truly scenic route down to town, across a field with lovely views of the undulating countryside, crossing the canal on the way to Yak Yeti Yak. Here we were joined by Jim (our leader) and his friend Laura, who lives in Bristol, and would be joining us for our rides over the next 2 days. Thanks to Graham’s impeccable organizational skills, collecting our orders in advance and drawing up a comprehensive spreadsheet, we were able to deduce which dishes belonged to which Clarionisters. Having enjoyed some amazing Nepalese dining, it was time to pay the bill and find a bus to take us back up Bathwick Hill to our digs. There was a measure of irony in a bunch of folk touting senior bus passes asking the driver to drop us at the Youth Hostel. We managed to be up, breakfasted and mounted on our bikes by 9am and headed in a downward direction (bearing in mind the author has no sense of compass points, but knows a hill when she encounters one). We cycled along the Kennet and Avon canal tow path and into Bath to meet up with Laura, ready to start our journey to Bristol. 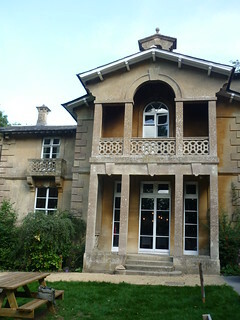 Terri was to spend the next couple of days exploring Bath on foot, and was planning a visit to the Jane Austen house. 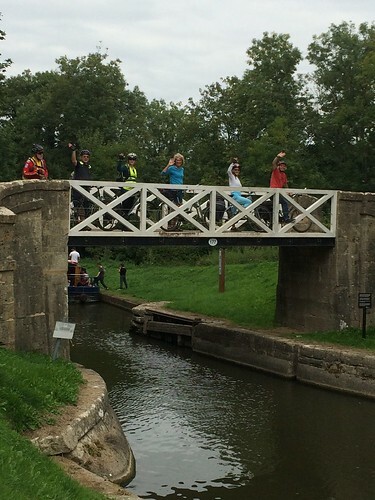 Our group of 9 cyclists followed the River Avon, joining the Railway Path at Kelston. 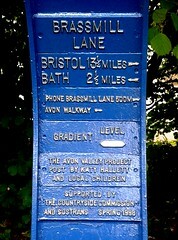 Photographic evidence was obtained by Jim, that the path was ‘level’ as inscribed on a metal information sculpture. As the day progressed, no counterclaims were noted. Is this a Clarion first? We halted every now and then to read the useful information boards, giving us some of the history of the Railway Path, which was constructed on the track bed of the former Midland Railway, which closed in the late 1960’s. Just off the railway path, we were able to get a glimpse of Greenpark Station’s former glory, now hosting a streetmarket and Sainsbury’s car park. Bitton railway station provided a welcome coffee stop, where some of us opted for seats in a railway carriage by the name of Margaret (named after the woman who first provided a voluntary catering service). At this point David, struggling to find the word ‘shorts’, came out with ‘short sleeved trousers’! We posed for a group photo to send to Julian using a postcard app, which simply said what we were thinking – ‘wish you were here’. Jim commenced the ‘cat herding’ exercise of trying to get us all biked up and heading off in the same direction as him, and finally resorted to blowing his famous whistle. This coincided with a steam engine chugging backwards from the station into our line of sight. Or did the whistle blowing inadvertently signal the engine to move……? Off we cycled, along the nicely tarmacked, tree-lined track, pleasantly lacking in undulations, stopping for a closer look at Old Mangotsfield station with its amazing sculptures in the arched windows. It was sitting here waiting for a train that inspired Arnold Ridley (Private Godfrey from Dad’s Army) to write the famous play ‘Ghost Train’. There were numerous references to the nearby Keynsham …. K E Y N ……. We encountered our first tunnel of the weekend shortly after, and Laura introduced us to the local custom of calling out ‘choo choo’ as we cycled through. It was dank, dark and chilly, with random drips of cold water, but we soon emerged into the welcoming sunshine and resumed our journey. A brief tour of suburban Bristol led us to our lunch stop where several pints of Doom Bar were imbibed, along with a range of dishes suiting all dietary requirements. 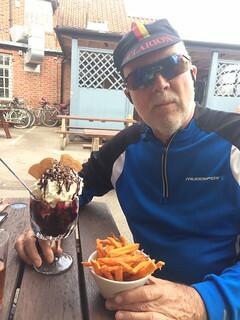 Unfortunately David’s sweet potato fries arrived simultaneously with his knickerbocker glory, but he stoically alternated between the one that was too hot and the one that was melting. We returned to the River Avon via Hanham estate and continued along more picturesque paths until we reached our tea stop, The Old Lock and Weir pub, where unsurprisingly several of us opted for more beer. With a table right next to the river, we were lucky enough to get a good view of a heron walking across the weir, and Tessa sent a photo to Julian. It was here that David dramatically revealed that he colour co-ordinates his outfits to his bicycles and had mistakenly brought red gloves, instead of blue. We meandered off towards Bristol Temple Meads, where Laura left us to go home, and Tessa and Sikka went to meet friends. The remaining 6 of us took 3 trains back to Bath, due to bike restrictions. The first to arrive relaxed in the deck chairs near Bath Spa station, enjoying the sunshine, until we were finally reunited after a police incident delayed the other 2 trains. Finally came the lowlight of the day – the climb back up to the dizzy heights of the YHA (at around 460 ft above sea level). On the way, all were happy to rest a while looking back at the lovely views along the way. What a great day’s cycling, covering about 24 miles. A later start, leaving the hostel at 10am, after a hearty hostel breakfast. We said goodbye to Angela D at Bath Station, as she had commitments to get back for, and welcomed Laura, plus Phil, a friend of Sikka’s who lives in Bath. 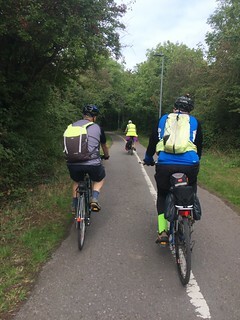 Still 9 cyclists, albeit slightly different ones, we followed Jim along his chosen route to the Two Tunnels, again appreciating the picturesque, flat and tarmacked cycle paths next to the canals and rivers. 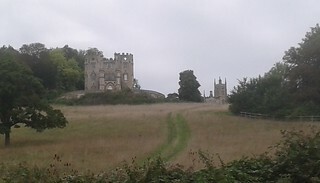 Part of today’s route was formerly the Somerset and Dorset railway, which ran south-eastwards from Bath towards Bournemouth. The engineers among us were impressed by the range of bridges we encountered across the waterways. The rest of us were impressed that David was sporting his red Clarion shirt which matched his gloves, but as noted yesterday, there was a failure of colour coordination with his blue bike. We were soon entering the first of the famous two tunnels, the Devonshire, which was an amazing experience – darker, colder and longer than some of us had imagined, and sparsely lit. We realised why we were advised to use our bike lights. This prepared us for the second and seriously long tunnel we next encountered, the Coombe Down tunnel. 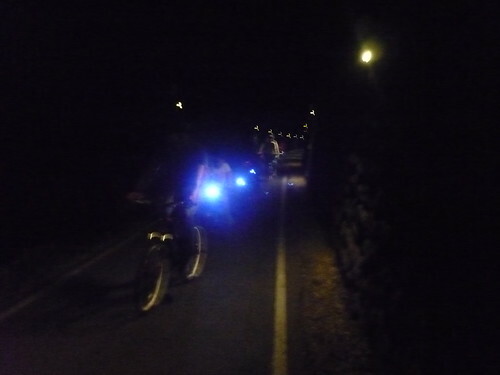 Although it was a warm day, most of us decided to put on a jumper, and switch on our bike lights to find our way through the darkness to follow. It was a strange and unforgettable experience, taking around 10 minutes to cycle the mile long tunnel, passing a few cyclists coming from the other direction, as well as several pedestrians and dogs. After a few minutes of pretty much silent cycling, we could just detect a sound, which gradually got clearer and louder until we could identify it as string music. It seemed to be playing from alternate sides, and the volume increased and decreased as we passed each speaker, which was accompanied by some coloured ambient lighting as we progressed through the tunnel. The music and lighting subsided as gradually as it had emerged, and once again we experienced quietness and darkness, until daylight could be detected at the end of the tunnel. We tarried a while to read an information board about William Smith whose ‘ground breaking’ work listing the local rock layers in his Order of Strata earned him his reputation as the Father of English Geology. Some also enjoyed investigating the wind up and listen audio post. More tranquil tree-lined track took us past Midford Castle, a folly nestled among some trees on the hillside, and on towards our lunch stop. With a significant number of noticeboards to stop at along this route, some folk were having difficulty dismounting and remounting their wheels, prompting David to mutter that he can only get his leg over twice an hour and he’d already had to do it 12 times before lunch! Someone suggested a bike with a gender fluid step through arrangement might help him get his leg over more easily and more often. Oh dear. The tone of conversation had plummeted. Fortunately, the Hope and Anchor pub was in sight. Popular with cyclists, but only those who also like to weight lift, as the bike racks were at the bottom of the stairs into the pub garden. We soon forgave this cruel back-twinging arrangement, because the food was delicious. After lunch, we said goodbye to Tessa, who was meeting friends at Wellow (see her addition to the report below) and Phil. On leaving the pub we cycled through a short tunnel, or long bridge, before leaving the Two Tunnels route and joining a lane which took us to Tucking Mill Cottage, displaying a plaque telling us that William Smith had lived here. Close by, we noted Tucking Mill Reservoir, which has been designated for the use of disabled anglers only since 1981. More idyllic cycle paths alongside the Kennet and Avon canal took us to the next spectacular viewpoint, which was the Dundas Aqueduct, carrying the Kennet and Avon canal over the River Avon. Soon after this, we could not resist the call of a tea stop at a canal boat, where we managed to find cakes, tea cakes and a range of teas to satisfy everyone. Graham was first to experience the misery of having filled up on tea, only to discover that there was no toilet, but he resourcefully secured instructions on how to access the nearby pub facilities. One by one, we experienced the same quandary and Graham patiently described the route to the required destination. Eventually a plan emerged to all cycle over to the loos before resuming our bike ride. However, when we gathered back on the tow path, Jim noted that we were one cyclist short, and none of us remembered David joining the toilet posse. We realized we had been somewhat pre-occupied with the toilet shenanigans and had not ensured that everyone had been made aware of the detour. Fortunately we were able to make contact with David, and arrange to meet further along the way. Another great day’s cycling, covering around 15 miles. 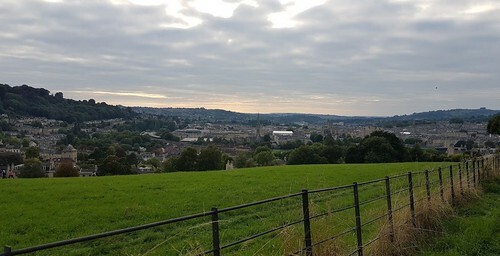 Our dwindling number gathered at the bottom of Bathwick Hill, only to divide further. David, Prudence and Graham would be meeting up with Terri and staying a further night at the YHA, Sikka was to stay a further night in Bath with her friends Phil and partner, and Jim, Wendy and Laura were to return to Bath Spa station to negotiate a route home that avoided the bus replacement services. 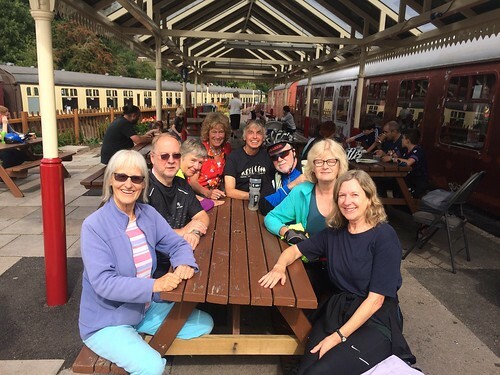 There was a note of sadness as we went our separate ways, having spent a wonderful weekend together, enjoying the friendship of our fellow cyclists, as aspired to in our Clarion motto ‘Fellowship is Life’. Thanks to Jim for sharing your discovery of these cycling experiences, especially the vast, haunting tunnel with its light and sound installation. It was an informative, fun and fabulously flat foray. Thanks also to Graham for arranging our Friday night feast and to David for providing some classic comedy moments. The tarmac track leading to Wellow changed into an acceptable gravel path leading to a cafe with coffee, delicious cake and ponies. My friends collected me and took me back to Frome where I perfected my front wheel removal and assembly technique as they were going to drive me back to Bath the following day in their small car. We spent this morning relaxing at Bath Thermal spa, (rooftop warm thermal pool with jacuzzi in the sunshine plus steam rooms and sauna) the perfect end to our lovely cycling trip. Report contributed to by all and co-ordinated by Wendy, with special assistance from Graham and Prudence. This entry was posted on Sunday, September 9th, 2018 at 1:53 pm and is filed under Ride report. You can follow any responses to this entry through the RSS 2.0 feed. You can leave a response, or trackback from your own site.